The senior years can be a time filled with relaxation and joy, but feeling happy isn’t something that just happens. Seniors who want to truly enjoy the golden years need to be proactive and take steps to achieve happiness. Humans are social by nature, so friends and loved ones are an important part of enjoying the senior years. Spending time with friends helps seniors feel truly engaged and connected with others. Even if your loved one isn’t outgoing and doesn’t have a large social group, it’s possible to build relationships through local book clubs, exercise classes, activity groups, or online meetups for seniors. Exercise is essential for remaining fit and independent during the senior years, and it doesn’t require doing anything too intense. Even simple activities like walking around the block or going for a swim can build strength and endurance. Exercising is also an essential part of leading a happy life because it combats depression. The body creates endorphins that boost mood during a workout. Many seniors require assistance to safely perform exercises at home. Rhode Island elder care experts are available to provide high-quality care to seniors on an as-needed basis. From assistance with mobility and exercise to providing transportation to the doctor’s office and social events, there are a variety of ways professional caregivers can help your aging loved one continue to live independently. After retiring, it’s easy to just settle into lazy days in front of the television. Though relaxing is fine in moderation, seniors are more likely to be happy when they have defined goals. There are many hobbies your loved one can pick up, ranging from gardening to woodworking. Try to find something that will keep him or her feeling enthusiastic and excited. Hobbies that require learning new skills are a good option because they keep the brain active. For many families, it’s not always possible to assist their loved ones with hobbies and other activities. Family caregivers sometimes need a break from their caregiving responsibilities. When they need respite care, Rhode Island families can rely on professional caregivers to help their senior loved ones remain safe at home. 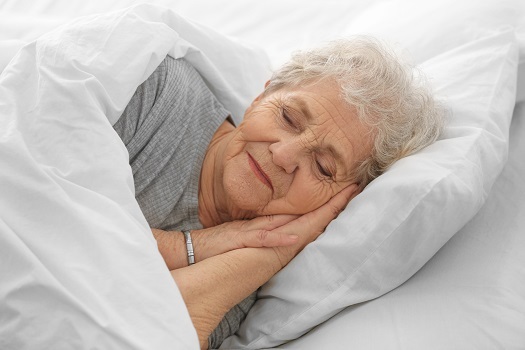 To have the energy for a full and happy day, seniors need to aim for at least seven hours of sleep a night. Getting less than seven hours is associated with depression, increased stress, and other issues that prevent seniors from enjoying the golden years. It can be challenging to sleep enough, so encourage your loved one to go to bed early, avoid screen time an hour before bed, and keep his or her room as dark as possible. It might be tempting to live in the past, but seniors who take advantage of everything modern living has to offer tend to be happier. Many helpful technologies make it easier to stay connected, run errands, and remain healthy. It’s also useful to check out new musical artists, trendy foods, and other novelties because experiencing new things engages the brain. Receiving high-quality care at home is another way to enjoy a happy life in the golden years. In Rhode Island, home care agencies can be a great boon to seniors. With the help of the caregivers at Home Care Assistance, your aging loved one can lead a happier and healthier life. We offer a revolutionary program called the Balanced Care Method, which encourages seniors to eat nutritious foods, exercise and socialize regularly, and focus on other lifestyle factors that increase life expectancy. Call us at (401) 284-0979 today to speak with one of our qualified Care Managers and learn more about our premier senior in-home care plans.